Hello y'all! I hope everything is alright. If not, this post is perfect then. Last Sunday, for Sunday school, the pastor talked about reading the whole Bible so that you know what is what about everything and to know how the Bible works with itself. So he gave out 'read the Bible in a year' plans and I started reading right away. I came across these verses while reading. Job, he had everything taken from him. His kids, his livestock, all of his servants, he went from super rich to super poor within only a minute. 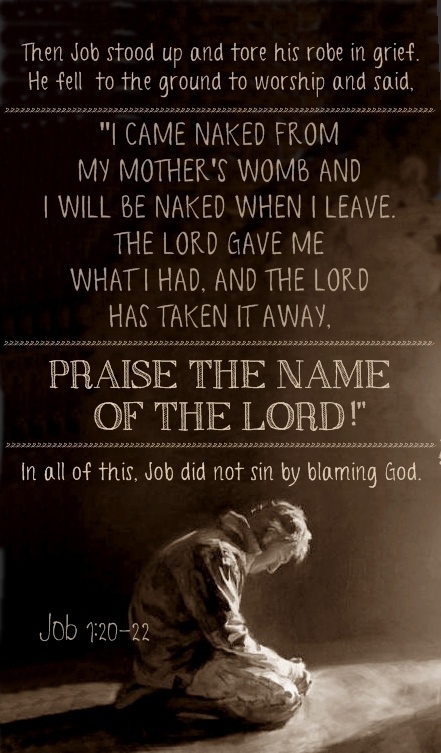 Even though all of what he owned was taken from him, he praised God. He praised Him because he knew God knew what was happening. He praised Him because he knew God was still with him. He praised Him because he knew that God always has a perfect plan for His children. When you feel like the world ﻿is closing in on you, praise God. Praise Him for His salvation He gave to you. Praise Him because He could just leave you but instead He promises to never leave you nor forsake you. In all trials praise Him. It will seem hard right in the midst of the trial but, if you stick with God, it will only make you a better Christian, a better person. Just like Matt Redman sang "You give and take away, My heart will choose to say, Lord, Blessed be your name". It isn't always easy, actually tough times are never easy. But just look to God. Lean on Him and trust Him. While doing that, be praising Him. Life, especially the Christian life, isn't easy but God has blessed you with so much so look at that instead of what is happening. Yes Miss Becky. We must always praise God for everything. His ways are not ours but in the end he only wants good for us. Praise His Name. Definitely having to exercise this a lot right now! Everything is not simply smooth and easy and praising God through everything is certainly hard, but amazingly rewarding!